Say the following aloud with a French accent: "Ooh! Magnifique!" There's something truly magical about France. I'm not quite sure what it is. Perhaps it's the relaxed mood of the country as a whole, or maybe it's the country's love affair with eating well. Whatever it is, I am proud to call myself a Francophile. I went to Paris for a week when I was 8 years old, and this was where the love affair with all things French began. The one thing I very vividly remember about Paris was the crêpes. The chef would pour the thin batter onto a large, flat grill, and spread it out with some little utensil that looked like a miniature broom scraper. The crêpes were huge. This past week, my dad went on a 9 day business trip to France. Raise your hand if you feel sorry for him. 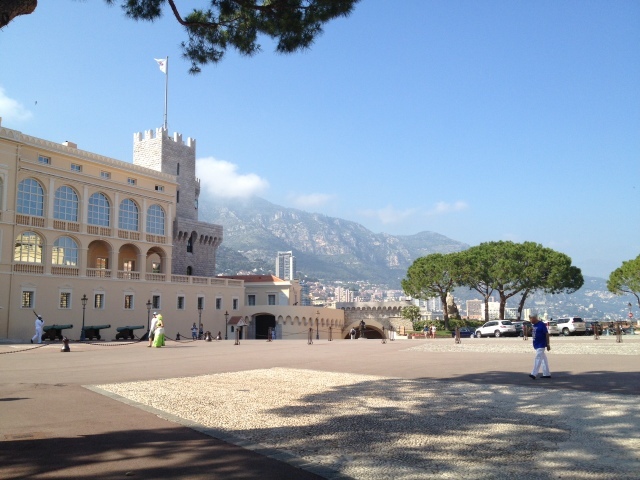 He went to Nice mostly. Look, everyone's wearing tops! Whooda thunk it?! Well, upon his return from France, I thought it would be nice (see what I did there?) to make him some crêpes. I'm sure he was sick of French food by then, but who doesn't love a good crêpe? 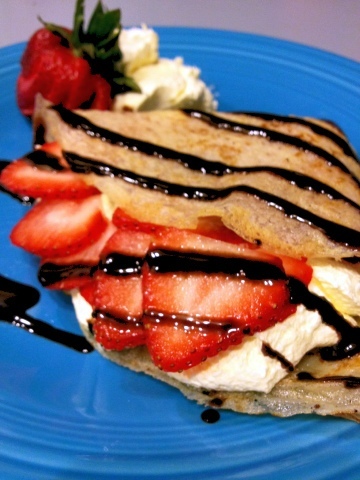 Note: If you're making only dessert crêpes, you can use up to 2 tbsp of sugar to make a sweeter crêpe. 1. Mix together eggs and milk. They need to warm up to room temperature. In the meantime, melt the butter, and let it get down to room temperature, too. 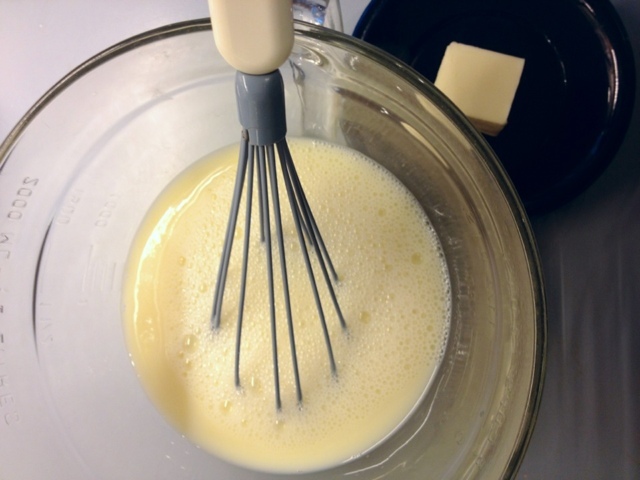 You don't want the butter to solidify in the batter. 2. Mix flour, sugar, and salt. 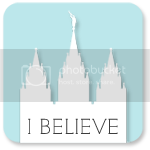 Sift. 3. 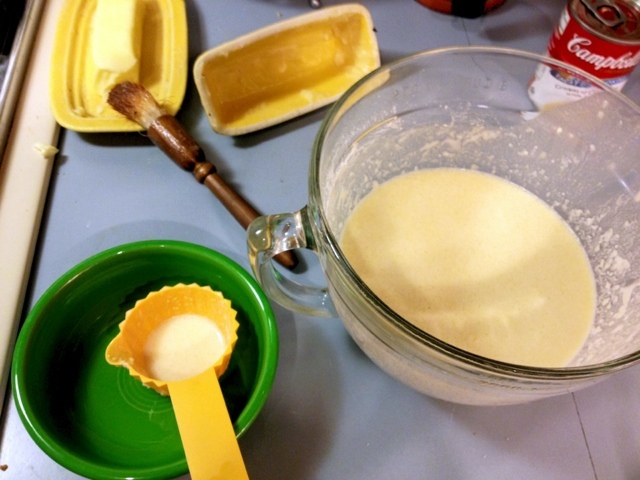 Making sure the wet ingredients are all at room temperature, mix the butter with the egg/milk mixture. Add dry ingredients slowly, while stirring constantly. When it's all added in, I tap the bowl on the counter a few times to get out any major bubbles. 4. 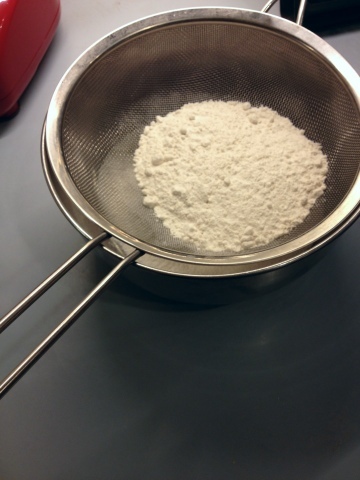 Now run all of the batter through the sift, making sure to throw out any stubborn flour clumps. Do this twice. 5. Turn the stove on medium heat and let the pan heat up for about a minute. You can check to see if the pan is properly heated by getting a cup of water, wetting your fingers, and sprinkling some of the water on the pan. If the water quickly sizzles away, the pan is heated up. If the water sits there not bubbling, the pan isn't hot enough yet. 6. After generously buttering the bottom and sides of the pan, use a small measuring cup (about 3 tbsp for the 9" or 2 tbsp for the 6") to transfer the batter into the buttered pan. Quickly lift the pan off the burner and tilt the pan in a circular motion to spread the batter around the bottom of the pan. This is my setup. Most of the butter was gone by the time I finished. 7. 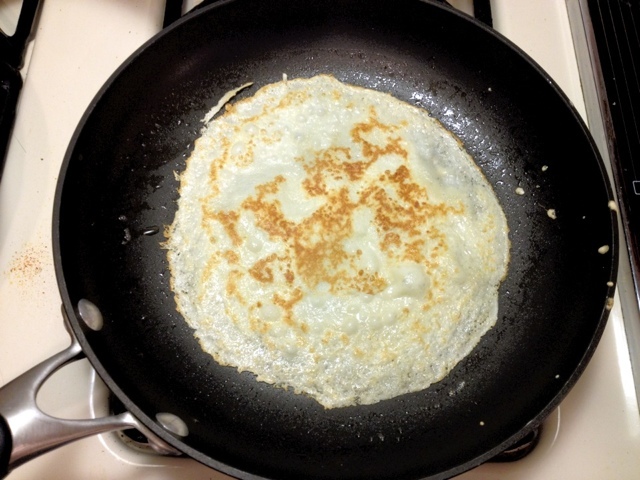 After anywhere from 15-30 seconds (depending on the size and thickness), the middle of the crêpe will appear dry on top (much like when cooking American pancakes). 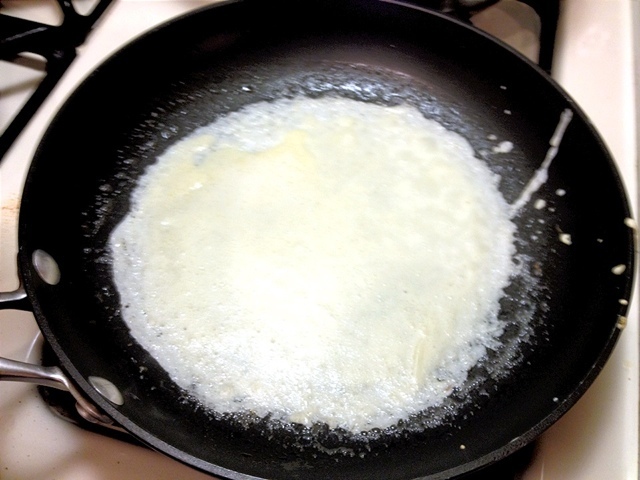 Use a nonmetal spatula (so as to not ruin the nonstick surface of the pan) to flip the crêpe. 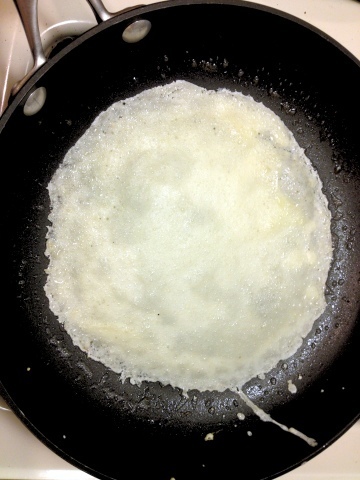 This crêpe is still wet in the middle. It's not done yet. Now it's done! The edges are beginning to turn golden brown. 8. The other side needs about 15 seconds to cook it, but if you like a delicious buttery lace pattern on it, it may need up to 30 seconds. 9. 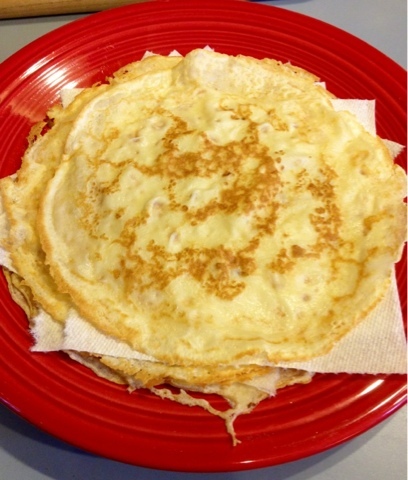 Place the crêpes atop paper towels or cheesecloth, putting one layer of the towels in between each crêpe so they don't get soggy. 10. 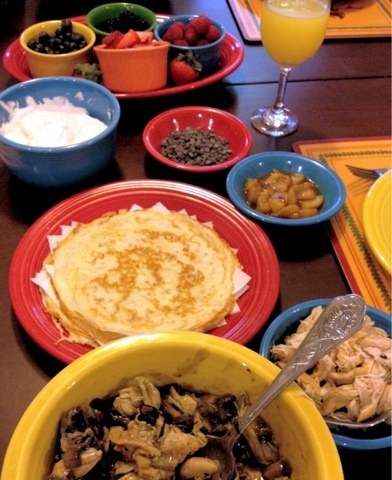 Fill the crêpes with either savory fillings such as mushroom and chicken, or sweet fillings such as creme fraiche (fresh whipped cream) and fruits. 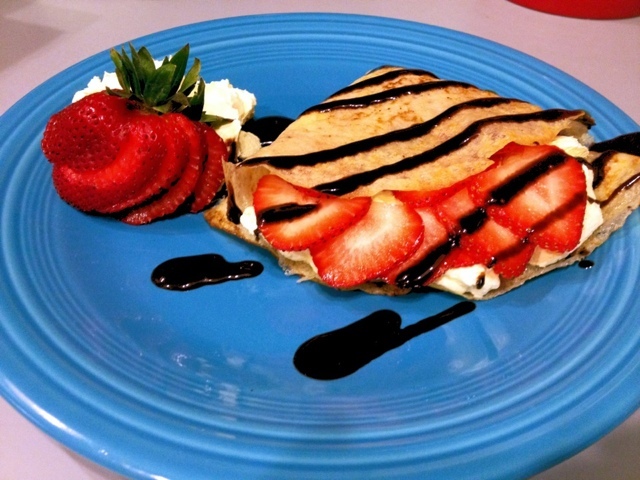 With savory crêpes, you can also grill them after filling them to fully melt the cheese.